Let me set the stage for this image, if I may. My man-date, Scott, months ago was working at a hoteling desk at the top of this staircase. There he saw a co-worker actually fall down the steps to that landing you see right there. However, her head kind of went through the wall. And by "kind of", I mean it did go through the wall. Yes, I know we should all feel bad about this, but it turns out accidents like this get people talking and it turns out not tons of people had kind words to say about this woman. Oh, the things that bring the office closer together. It's not like Scott pushed her down the stairs.......or so he claims. It's not irony or kismet, but poor Scott took a tumble himself this last weekend. That co-worker didn't watch him. Some 20 year old hipsters had to pick him up after his fall. This was after "grandpa" went to an indoor BMX track and kind of did some damage on the course he was never meant to ride. Should I mention he doesn't own a bike and hasn't ridden in years - let alone a mountain bike? It turns out, that every trauma doc in the city is aware of this indoor park. How does Scott know this? Well, since he had to be transported from one hospital to the trauma hospital, those docs dropped a little knowledge on him. The story came to me as four broken ribs, a broken leg, punctured lung and bruised spleen. It wasn't as bad as all that, but it still left him in the hospital for three days. I spoke to his wife, but not him.....well not until yesterday. I didn't want to make him laugh, since he was in so much pain. But yesterday he sent me an email asking for me to just get it out of my system and say whatever I wanted to say since he was bracing for it. Honestly, I had nothing snarky to say. For a half a day, before I knew of details, I was genuinely worried about him. He's good. He's at home, resting. I'll see him in a week or so. Oddly enough, he still wants to buy a bike and go riding this summer. We'll see if follows through with that. I can't blame him if he doesn't. 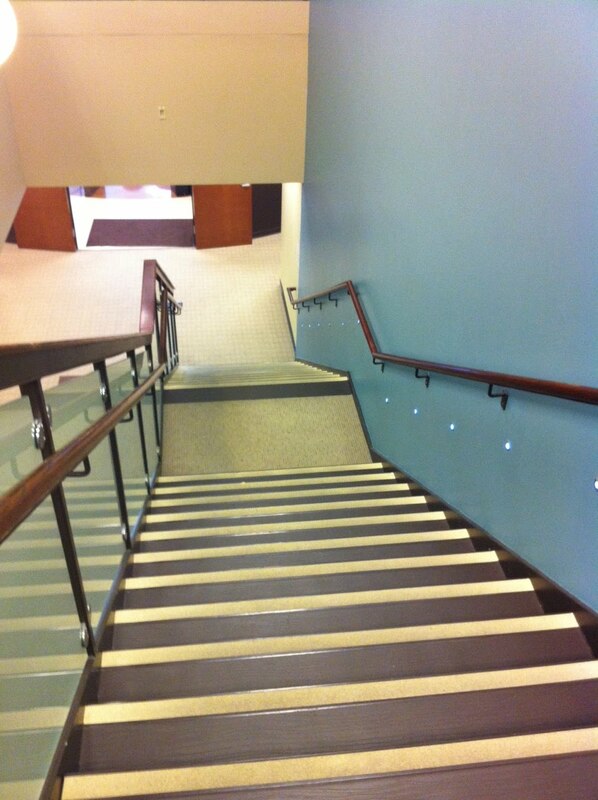 I have already met my lifetime quota for falling down the stairs: twice. I can't recommend it. My tailbone will never be the same after that last fall. Glad your friend is going to be okay. For all the flak I get for living in Cleveland, the medical and legal care here are unrivaled. Hope your friend mends quickly, with as little pain as possible. One never can use kismet in a sentence enough. You had me at it was not your fault. Of course all bad things in the universe are your fault. You should start calling him "Showgirls". What the hell is a "hoteling desk"? And why is it at the top of a staircase?